As 2018 comes to an end, we have witnessed multifamily real estate enjoy price appreciation and strong occupancy levels for almost a decade now. The asset class is the most actively traded in real estate, as we observe record levels of capital inflow with $153 billion in sales volume, a 3.5% year-over-year increase in 2018, the second highest level on record according to Real Capital Analytics. A strong labor market, above average household formation, and a scarcity of starter homes continues to buoy the rental market. This upward trajectory continues to attract a wide breadth of investors from mom-and-pop DIYers to large institutional investors. Why Invest in Multifamily Real Estate? With a diversity of tenants and leases that expire on a rolling basis, multifamily operators can more easily ratchet up rents to capitalize on increased demand, and/or to keep pace with inflation. Because housing is the most essential function in the built environment, and because renting becomes more appealing (and more feasible) than owning a home in times of uncertainty, multifamily tends to be less vulnerable to market downturns and exhibit less volatility through market cycles than other CRE asset types and the single-family market. With many marketable units and a diversity of lease structures and expiration dates, multifamily operators can more easily maintain close to 100% occupancy. As the Federal Reserve increased interest rates four times in 2018, investors are feeling anxious as the yield spread tightens. Overall, capitalization rates have held flat over the last few months, and rental fundamentals are unlikely to change considerably in 2019. According to data from Newmark Knight Frank, the U.S. average cap rate compressed to 5.4% in Q3 2018, a decrease of six basis points year-over-year. Yields currently average 4.7% in major markets and 5.6% in non-major markets. To help add perspective on these rates, the 10-year U.S. Treasury ended 2018 at 2.7%. The 10-year note is often used as a proxy for long term debt financing on individual assets. As we are getting later in the real estate cycle, multifamily sponsors are beginning to insulate themselves from pending turbulence, and in doing so, some have journeyed from opportunistic to a more core or core plus strategy. Furthermore, they have broadened their search to include lower quality or dated class B or C assets, suburban locations, and properties in secondary or tertiary markets. These properties tend to have higher capitalization rates, as investors are paid for taking on the additional risk of investing in an older property, or a property in a lower income neighborhood. According to Prequin, gateway markets such as New York and Los Angeles remain the leading recipients of investment, although several top-tier secondary markets experienced material growth as well. As companies compete to attract skilled employees, the enticement of urban life in some of the U.S.’s major cities cancels out the cost of living and doing business. A growing number of “18-hour cities” are emerging as feasible alternatives, offering many of the perks of big city living without the enormous price tag. Phoenix, Portland and Tampa Bay are cities where data supports macro demand drivers for multifamily real estate investments. This thesis is supported by trends in skilled labor migration, rent growth, and absorption. LinkedIn tracks monthly employment movement of skilled professionals and nicely carves out those individuals who relocate. 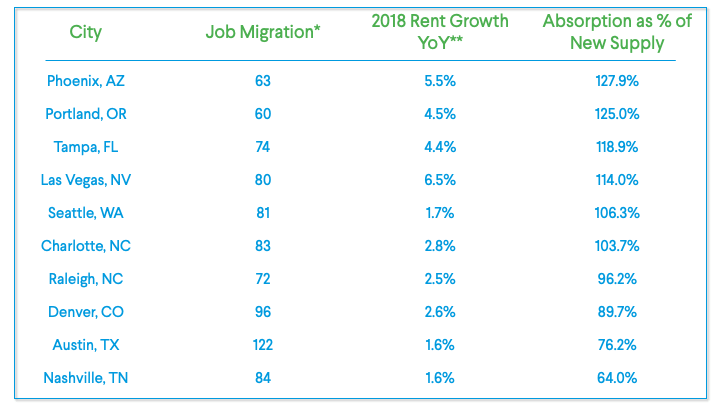 Cross-referencing this talent migration with absorption of new supply for multifamily and rent growth (Axiometrics) helps solidify the growth theory in the aforementioned MSAs. Las Vegas exhibited similar characteristics, though the city has historically experienced housing volatility. Prices declined by 63% from 2006 to 2011 but are now reaching pre-recession levels. Tampa Bay and Portland are popular – particularly with Millennials and entrepreneurs looking for high paying jobs, business opportunities, and affordable housing. 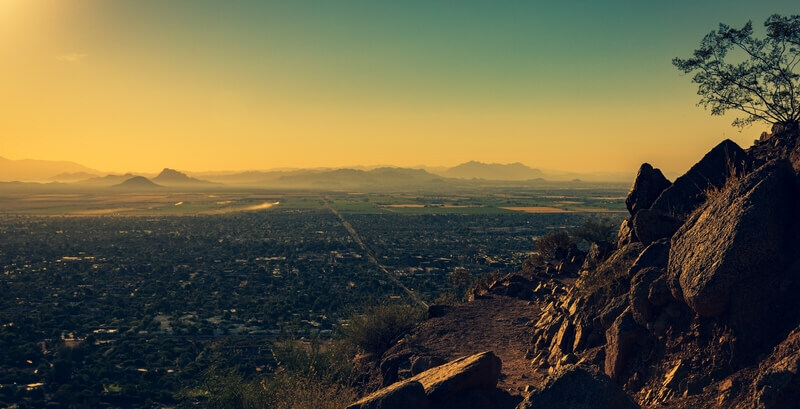 In addition to the warm weather, Phoenix has seen robust employment statistics with the burgeoning of medical, technology and education fields. * LinkedIn: defines migration instances as a member changing their location on their LinkedIn profile. To develop the list of cities that gained the most workers, we analyzed migration of LinkedIn members in and out of the U.S. cities for the past 12 months. So for every 10,000 LinkedIn members in Austin, 122 arrived in the past 12 months. There are several dozen value drivers that impact real estate value. We’ve isolated three critical metrics to uncover our top three cities to watch out for in 2019. Below we expand upon job migration, rent growth and absorption. In the most basic form, job migration refers to the inflows and outflows of individuals that seek employment in a defined location. A net increase in migration usually boosts the velocity and amount of money exchanged in a local market. It can include the spending habits of everyday consumer goods, retail shopping centers or even the amount of profit the banks make. With profound economic activity, it is more likely that there will be more demand for people renting which can impact the market positively. We looked at LinkedIn, which tracks when members change employment. 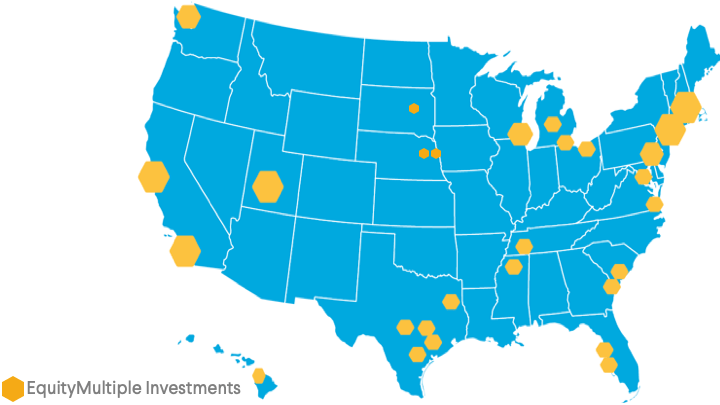 To summarize, the U.S. cities gaining the most people are Austin, TX, Denver, CO and Nashville, TN. For every 10,000 LinkedIn members in Austin, TX, 122 arrived in the trailing 12 months time period. Conversely, The U.S. cities losing the most people are Wichita, KS, State College, PA, and Bryan-College Station, TX. For every 10,000 LinkedIn members in Wichita, KS, 289 left in the past 12 months. Demand for rental apartments across the U.S. continues to rise, with strong leasing velocity pushing up occupancy and rent growth. The rising cost of construction is forcing builders to slow new housing starts as development becomes more difficult to pencil out economically. As more young adults form new households, many are struggling to become homeowners given the rise in real estate prices, ballooning student debt, and stagnant wage growth. Furthermore, baby boomers, like millennials, are flocking to rentals offering a ‘hands-free’ lifestyle. Census figures show this generation is the fastest-growing group of renters. More than five million baby boomers are expected to rent their next home by 2020 according to CNBC. Las Vegas, Portland and Phoenix are cities exhibiting the strongest rent growth across the U.S., all of which had mid-single-digit percentage increases in 2018 compared to last year. Supply and demand of units (or said differently, the balance between the two) is a major factor in the rental property market. It takes into account the amount of housing being built and the amount of housing required by the people living in that area. A larger number of people moving into a particular area can cause more demand for housing resulting in an imbalance, which could cause prices to rise. Absorption is measured as the change in the occupied rental stock of a defined market from one period to the next, which includes new stock built as well as the inventory put back into the market. In this case, we evaluated the trailing twelve month time horizon. Absorption is a negative number if the occupied stock in a property market decreases. Conversely, absorption is positive when the occupied stock of a property market increases. We then evaluated new supply numbers by simply obtaining the number of new units expected to hit the market in the next twelve months. This information is typically gathered as developers need to file permits and plans with local municipalities for approval. By dividing the two numbers, absorption as a percentage of new supply, we can evaluate if supply and demand is balanced. When the pipeline of new housing developments exceeds demand for housing, we expect prices to fall. We see this in areas like Nashville that have a record number of cranes in the air. Conversely, Portland and Phoenix are supply-constrained areas exhibiting metrics that point to demand exceeding supply. Data supports the thesis Phoenix, Portland and Tampa Bay are emerging cities with demand drivers for multifamily real estate investments. It makes sense to break down and get into some detail on the three markets. In Phoenix, the warm climate has always been an easy selling point. Today, at least as it relates to the local economy and rental demand, the attraction is jobs. According to a recent report published by Bank of Montreal, Phoenix has shown the strongest population growth metrics in 2018 since the recession. Additionally BMO reports a projection of 3.2% GDP growth for 2019. An emerging high-paying technology sector is helping to put Phoenix on the map. It now accounts for about 5.5% of employment in the “Silicon Desert.” That’s well above the national average of 4.8%. Phoenix also boasts a particularly favorable demographic profile for apartment rentals. Millennials make up more than a fifth of the population. This age group is growing in Phoenix at five times the national average. That bodes well for future demand for multifamily properties. Portland is a national leader in terms of employment, tax revenues, home prices, mortgage delinquency, and publicly traded companies’ equity. 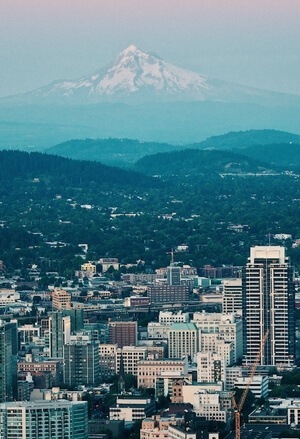 It is anticipated that Portland’s job growth in the next 10 years will be 41.2%, according to Bloomberg. The expected job creation in the near future means that migration into the metro area will continue, pushing demand for housing and creating tailwinds for real estate property prices. Portland is home to a number of renowned institutions of higher education, one of the most respected and largest medical centers in the country – Oregon Health & Sciences University – and one of the most distinct and highly lauded beer, wine and food scenes in the nation, contributing to tourism that generated over $5 billion in direct spending in 2017. Tampa had one of the fastest growing job markets across the U.S. in 2018 according to the U.S. Labor Statistics. Non-farm payroll employment in Tampa has grown 15% over the past five years, totaling 1.37 million by the end of 2018. Tampa also scored high marks in amenities and quality of life. Drivers in Tampa spend very little time in congestion, a major positive because traffic jams are a detriment to business productivity and cut into worker personal time. Many higher education graduates in Tampa Bay are obtaining science, technology, engineering and math degrees, which generally lead to higher paying jobs. Tampa is also home to a burgeoning foodie scene, coming in at number 11 on Food & Wine magazine’s list of top places to go and eat in 2019. With robust economic activity, it is more likely that there will be more demand for people renting which can impact multifamily assets positively. The map below shows our current portfolio and exposure to various markets. Our deal team continues source deals in primary and secondary markets, where risk-adjusted return potential to be greatest. Furthermore, we are doing our best to insulate our investors, and one way to do that is not only by picking high-quality sponsors but also MSAs that show strong real estate demand drivers for multifamily properties. Our pipeline is robust and we are actively seeking offerings in the Phoenix, Tampa Bay and Portland in 2019, all of which we deem as markets to watch in 2019.